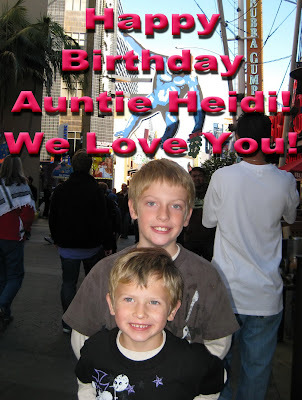 My Wandering Life: Happy Birthday Auntie Heidi! Today is the birthday of Michael's youngest sibling, his sister Heidi. She lives in Virginia with her hubby Clay and two of our nieces. Between Michael and I, there are over a dozen birthdays that fall in the months of December and January in our two families. Which is why when we were planning our wedding we chose June for our big day. As far as you could get from the rest of the reasons to celebrate! Of course, WE were the ones who later blew it and ended up having a son born at the end of June! Oh well. Despite what they say, you really can't plan these things!